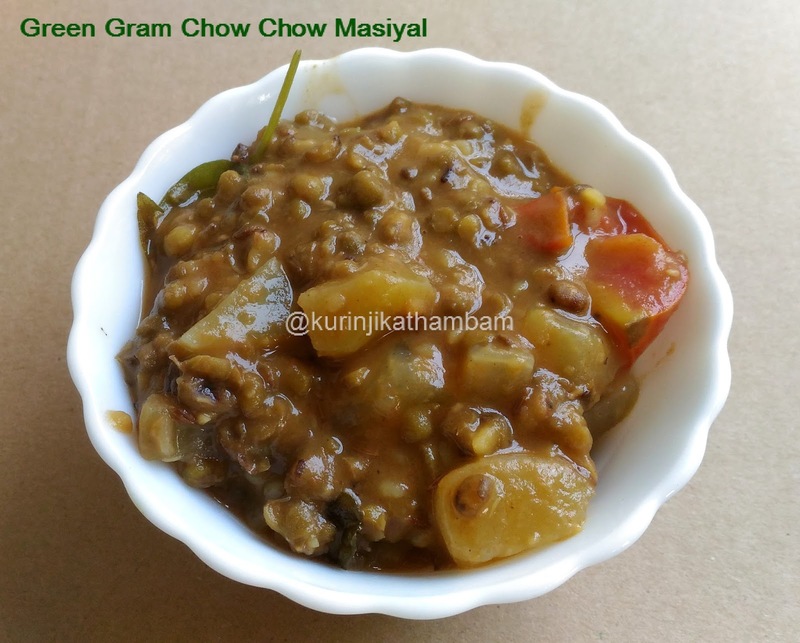 I have already posted two green gram masiyal recipes which are stand alone green gram recipes. In this recipe I add additional ingredient like chow chow. 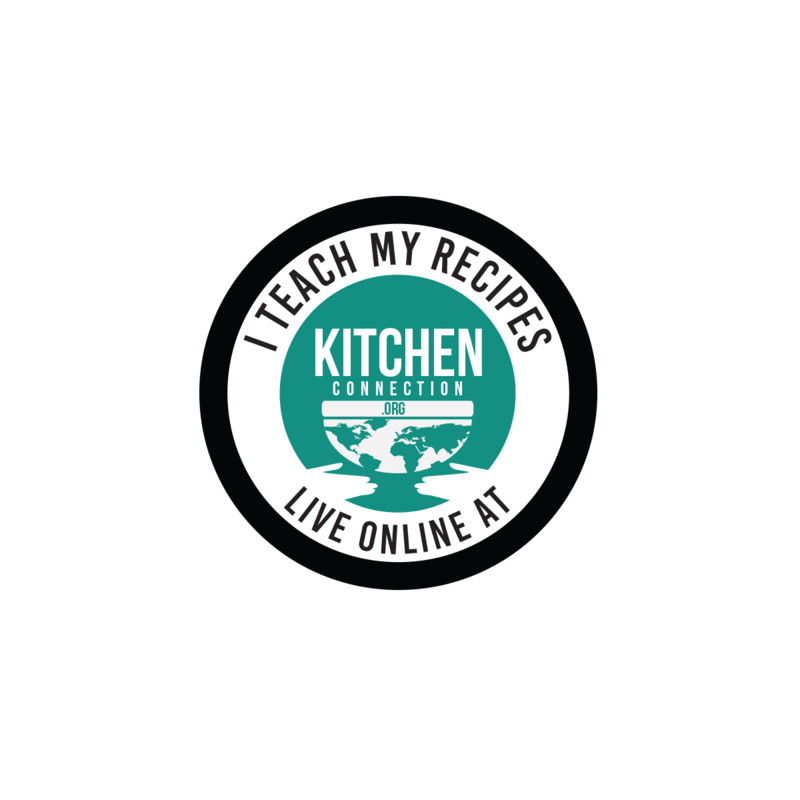 This recipe has a different taste and hence it is popular in villages. *Click HERE for homemade sambar powder recipe. 1. 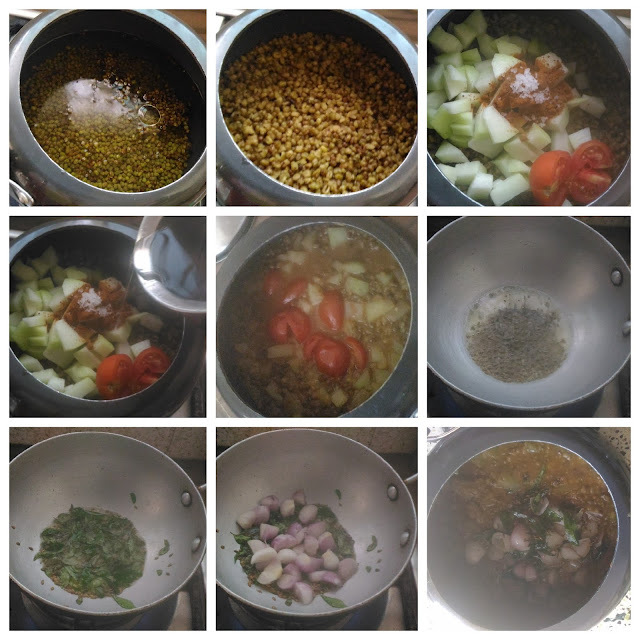 Wash and pressure cook the green gram with 1 ½ cup of water for 3 whistles in a medium flame. 2. Meanwhile, remove the skin and seed of the chow chow. Then cut it into 1 inch cubes. Keep it aside. 3. After the pressure has gone from the green gram, add chopped chow chow (from 2), tomato, sambar powder, salt and required water (1 cup). 4. Again pressure-cook the mixture (from 3) for 1 whistle in medium flame. Allow it to cool down. 5. Then heat the oil in a pan, add mustard seeds and wait for popping. 6. Add cumin seeds and wait for splutter. 7. Add curry leaves and sauté for few seconds. 8. Add chopped onion and fry till the onion becomes translucent. 9. Pour this temper into the cooked dal and chow chow mixture (from 4). Mix them well and cook till the mixture become little bit thick. Yummy and healthy green gram chow chow masiyal is ready. Serve this masiyal with rice. 1. You can also use big onion instead of small onion.